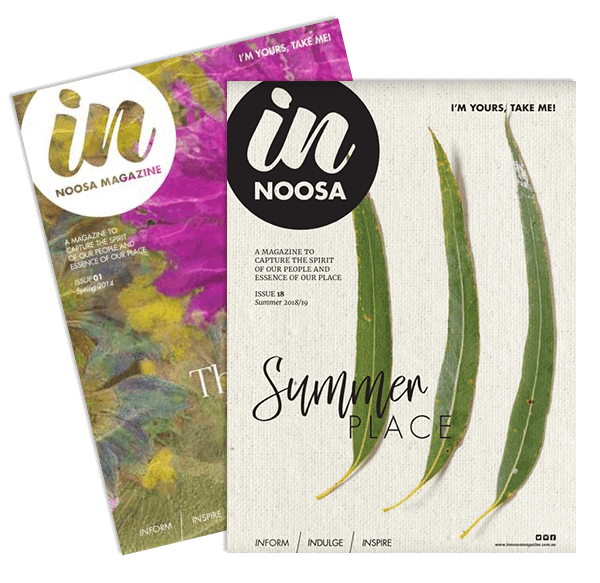 It is conservatively estimated that each copy of IN Noosa Magazine will be read by at least 4.5 people – that is at least 58,500 eyeballs on your business each quarter! Our distribution channel is unique with hand delivered copies to 900 local businesses, exclusive IN Noosa Magazine stands at key locations, exclusive placement in-room at prestige accommodation providers as well as in-resort from Coolum to Noosa. Request a media kit with more information including our advertising rates or download our booking form below. We hand-deliver the magazine to businesses throughout the region from hairdressers to professional offices, beauty salons, fashion boutiques, medical centres and other retail outlets; there are also up to 20 handcrafted IN Noosa Magazine stands across the region at high trafficked locations; with additional bulk drops in key locations such as Noosa Civic, Noosa Regional Gallery, IGA Cooroy, and Noosa Marina. For more magazine locations, check out where to find us. IN Noosa Magazine is IN the rooms, not just the foyer, of accommodation places such as: Sofitel Noosa, Peppers Noosa Resort & Villas, Netanya Noosa, Noosa Residences – Exclusive Boutique Retreat, plus luxury accommodation managed by Dowling & Neylan Real Estate, Ray White Noosa, Sunshine Beach Real Estate and Zinc Properties Noosa. We are also in the Tourism Noosa Visitor Information Centres and key local outlets. Advertisers receive the additional benefit of cross-media support on other IN Noosa platforms and channels including social media including Instagram, Facebook and Twitter with the additional dedicated food and fashion Instagram and Facebook channels. ; our email database of INterested people; website; plus our media and business relationships allow us to arrange radio advertising opportunities or partner with you on a bespoke event. …have purchased a product in the last 6 months as a result of a magazine ad. …consumer purchase intent than television or internet when looking at single mediums.